City of Portland and Vicinity Cumberland Co. Me. An uncommon 1885 map of Portland Maine by Gorge N. Colby and his partner J. H. Stuart. The map covers most of downtown Portland and Portland Harbor. Includes adjacent towns of Deering, Cape Elizabeth, Cash Corner, and Ligonia. 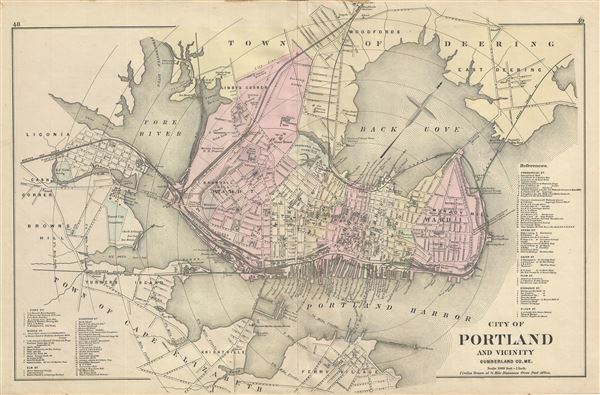 Portly is presented in exceptional detail with all streets, important buildings, rail lines, public buildings, docks, wharfs, and parks noted. An index of references divided between the lower left and lower right quadrants notes important business by street. Prepared for and published in Colby's Atlas of Maine, 1884. George Nehemiah Colby (January 13, 1846 - 1890) was an American civil engineer and map publisher active in Houlton, Maine in the late 19th century. Colby was born in South Berwick Maine and was married to Julie Gertrude Ganong (1853 – 1889). Colby's corpus of work consists primarily of Maine focused wall maps, county and state atlases, and more specific regional maps, for which he personally compiled surveys and sold by subscription. Colby initially worked with the U.S. Coast Survey, where his work contributed to the survey's important 1881 map of Mount Desert Island, Maine. In the private market Colby published Maine centered material in the style of Massachusetts cartographer Henry Walling. That is to say, he issued highly detailed maps on a large scale that he sold by subscription to local institutions and land owners. Colby's maps, like Walling's, are exceptionally desirable for anyone interested in family history, as they often list individual family names and land holdings. Colby partnered Frederick B. Roe in 1873 to issue wall maps of several Maine towns including New Brunswick, Thomaston, Bath, and Camden. This partnership lasted until about 1878 and maintained offices in Philadelphia at 31 South 6th Street. Colby later partnered with J. N. Stuart to similarly publish subscription-based maps and atlases of Maine, Communities. When Colby retired in the 1890s, Stuart fully took over his business. Colby and his wife had three children, George Nehemiah, Frederik Franklin, and Mary Gertrude. Colby, ., Atlas of the State of Maine, 1885. Very good. Original centerfold exhibits minor wear. Other maps on verso.